The work involved the reconversion and extension of the existing building, starting with the definition of a sophisticated architectural envelope which transformed the headquarters into a volume with vibratile materiality and seemingly elusive outlines: a device that promotes the energy efficiency of the building. The quality of the work spaces is a central theme of the project which, through the original system that can be seen on the façade, provides the cue for a new architectural solution with strong aesthetic value and high energy sustainability. The glass façade meets the twofold need of ensuring solar shading for the interiors and at the same time allowing maximum visual permeability for the surrounding environment. It also allows the acoustic and thermal insulation performances of the building to be improved: the double skin means the envelope can be naturally ventilated and the perimeter ventilation system combined with the internal forced ventilation system reduces the overall energy consumption. 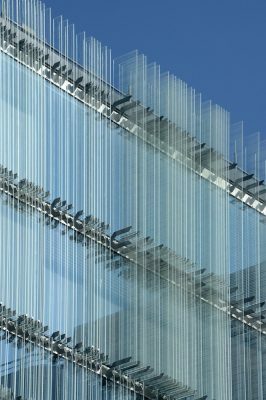 The steel structural elements on the façade, produced by Stahlbau Pichler, a specialist in the sector, create a modular rhythm and reflect on the glass shading panels giving material weight to the light reflections. The façade system is defined by simple rules which, through their repetition, produce a complex design of elements that varies with time and with the light conditions. The architect was inspired by the principles of Kandinsky, identifying the time variable and his capacity to achieve a scanning of the surfaces as capable of defining the compositional rhythm that shifts one’s perception of the architectural volume. The envelope is comprised of a triple layer of glass (hot chamber) added to which is a fourth layer with a ventilated chamber containing the package of micro-perforated Venetian blinds to regulate the light. 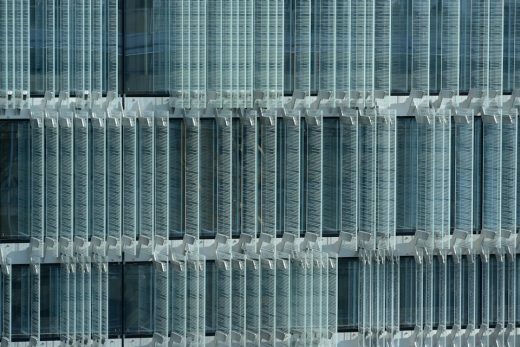 Brise-soleil screens made of screen-printed glass are anchored on the outside, giving the façade’s external surface a variable modular pattern in terms of both the panel dimensions and the design on their surface. The screen-printed graphic element on the screening panels helps to emphasize the reverberation effect produced, softening the perimeter surface of the building in a sort of evanescent and bright “nebula,” as Giovanni Vaccarini defines it. At night the glass panels are lit by white LED lights that bring the architectural block to life and make it shimmer, in dialogue with the nighttime urban landscape in which it is set. 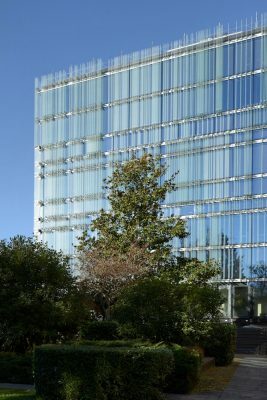 Seen from the inside, the glass envelope produces an effect that Giovanni Vaccarini describes as the “augmented window,” through which the view of the environment surrounding the building is amplified, reflected and transformed by the blades of light. From the outside, the “thick” surface of the screen-printed glass panels and the steel become a volume and define the very body of the architecture, whose outlines dematerialize into a pulsating material entity sensitive to colour changes in the surrounding area. The effect of this is that our perception of the building is continuously transformed. The overlapping visions we have of it, from both the inside and out, produce a kinetic effect. 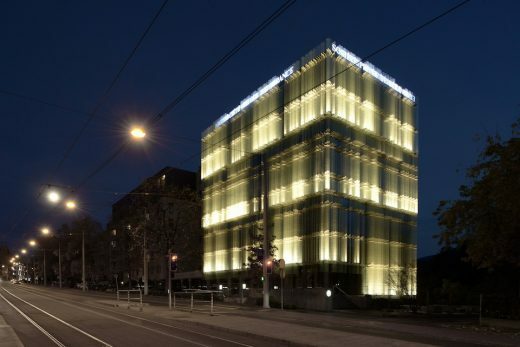 For this project, Stahlbau Pichler conceived a specific engineering system that would allow the “glass fins” that characterize the envelope of the building to be anchored individually. This system was fundamental to reduce all visual encumbrances to a minimum and hence allow the highest possible precision and integrity to the facade, as required by the architectural project. Static and aesthetic needs came together. It was also very important to reduce all weights to a minimum so as to manage the 100 tons of glass that have been added onto a pre-existing building that had its own structural constraints. These characteristics form the basis for the film “Deep into the Surface,” directed by Claudio Esposito and produced by The Piranesi Experience in collaboration with The Architecture Player, presented together at the new building. The film develops the abstract and conceptual dimension offered by the architect. Explored through different lenses, of which the macroscopic vision prevails highlighting the quality of its details, the SPG building, over the course of the short tale, reveals its dynamic character bestowed on it by the original façade solutions. The project for the new Headquarters of SPG in Geneva starts with the adaptive reuse of a pre-existing building to which we added to extra floors and a new facade. The quality of the workspaces was the central theme for us, which led us to completely redesign the exterior facade of the building. The new envelope consists of a first layer of triple-pane glass. A fourth glass layer contains the micro-punctured blinds to adjust natural lighting; screen-printed glass brise-soleil screens are anchored to the outside. The glass fins, placed perpendicular to the facade, come in three dimensions (20, 40 and 60 cm) and are spaced apart with varying distances, defining the entire facade. This whole system occupies a total thickness comprised between 40 and 80 cm. A “thick surface” that, starting from the design of the exterior envelope of the building, becomes the very body of architecture. A geometric system that, starting from the design of the glass fins, reverberates onto the interiors, the functional layout, the geometric pattern of the flooring made of local stone from Vals with stainless steel inserts. First essential requirements for the project have been to guarantee a good level of protection from the sunlight while, at the same time, not to limit the view from the inside outwards. Our solution was about implementing a stratified glass panel, finding a balance between the shading capacity of screen printing and their permeability to vision. The glass fins shape a “nebulous” envelope, that marks out multiple reflections and transparencies. During nighttime the glass fins are enlightened by white leds and transform the building into a kind of urban lamp. I think the result is extraordinary, in the literal sense of the term (out of ordinary.) A simple system that, when reiterated, produces a complex multiplication of visions, both on the inside and on the outside of the building; a kinetic architecture. Giovanni Vaccarini Architetti, based in Pescara, Italy, has developed projects on different scales, working to define innovative solutions that interpret residential, tertiary and environmental themes. In addition to designing the Headquarters of Société Privée de Gérance in Geneva, Giovanni Vaccarini Architetti recently designed a building for both commercial and residential use in Giulianova (Teramo).